Friendship and Memory Roses For Any Occasion! The rose bush will be permanently planted in the historical Laura Conyers Smith Rose Garden located in Loose Park, Kansas City, MO. Fill Out The Form Below To Place & Pay For Your Order Online! Thank you for selecting our Love Is A Rose online purchase option. In the form at right (or below if using a cell phone), please fill in all blank spaces. You can use your "TAB" key to forward through the boxes or, your mouse pointer. Once you have completed the form to your satisfaction, click the SUBMIT button. You will then be taken to our credit card / Pay Pal page where you can complete your application. 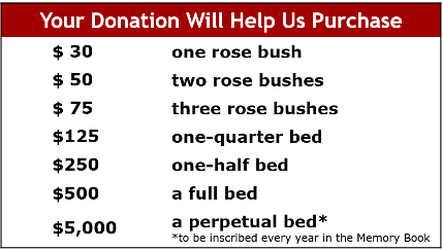 *Perpetual bed donation must be purchased by hard copy form only!